Add the fact that the twin boys still have to share a room and we want to convert the attic to create more rooms so they can have one each - and suddenly the shortage becomes apparent. Obviously kids should have rooms with a lot of daylight thus we need windows. Quality windows have their price, and we need eight of them. Go figure. So this is where you come into play (hopefully and only if you like!). After clicking submit a page on moneybookers.com with further instructions will be opened. 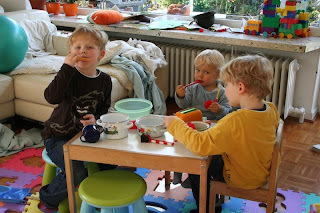 If you still like PayPal, you can also use it to send your donation to: karsten@k-fish.de. 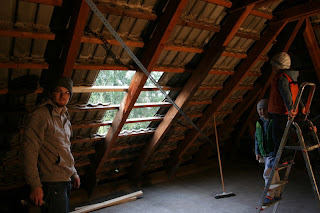 Here is a picture of our "test run" where I installed the first window already (did I mention we will do all the work ourselves, from windows and insulation to heating and electricity?). I know I am complaining on a very high level, so let's make a deal: ten percent of whatever sum comes in until christmas will be donated for a charitable cause. Ok?